!! OMG, gayer than gay: Rainbow Cake !! Sorry for all the food posts today, I’ve just started this new diet where I promise myself I’ll only drink coffee all day and all the while I dream about the food that I want and then finally at about 8PM I eat a full bag of no-name Crunchits and a mug of Baileys. 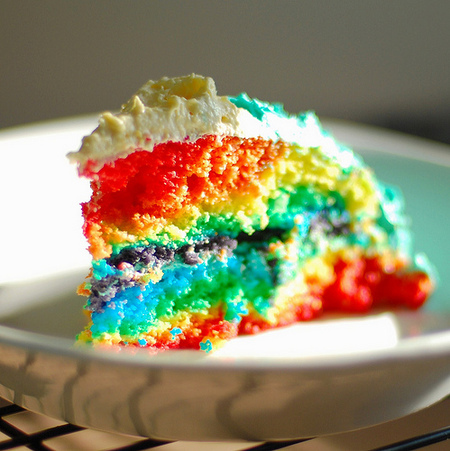 Anyway, if you lead a normal life and want a fun recipe, try out THIS RAINBOW CAKE at Omnomicon. 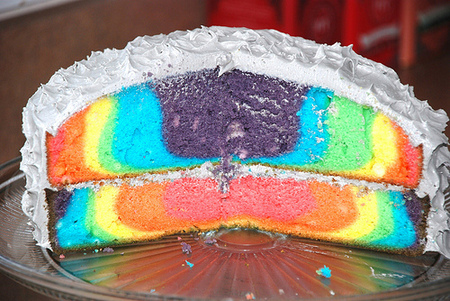 1 Comment on "OMG, gayer than gay: Rainbow Cake"
So pretty on the inside or when sliced.